As recently as 18,000 years ago, at the height of the most recent major glaciation, CO2 dipped to its lowest level in recorded history at 180 ppm, low enough to stunt plant growth. This is only 30 ppm above a level that would result in the death of plants due to CO2 starvation. I don't think that CO2 has been at 150 ppm ever since it got into the earth's atmosphere thousands of millions of years ago. (Correct me if I'm wrong.) It hasn't got that low in 500 million years at least. In any case, while 150 ppm is probably close to a threshold for some C3 plants to survive and reproduce, it is likely that many others would survive this according to a 2010 paper by Gerhart and Ward. What Patrick must have done was quite silly. I'd say he drew a straight line from very high CO2 levels in the past to those of recent times. That's not science. CO2 was much higher 140 million years ago, and has declined since then. However the decline was not steady at all. It was not a straight line decline. Over the past 140 million years CO2 has gone up and down. 140 million years ago was early in the Cretaceous when the earth was very different and well before humans came on the scene. 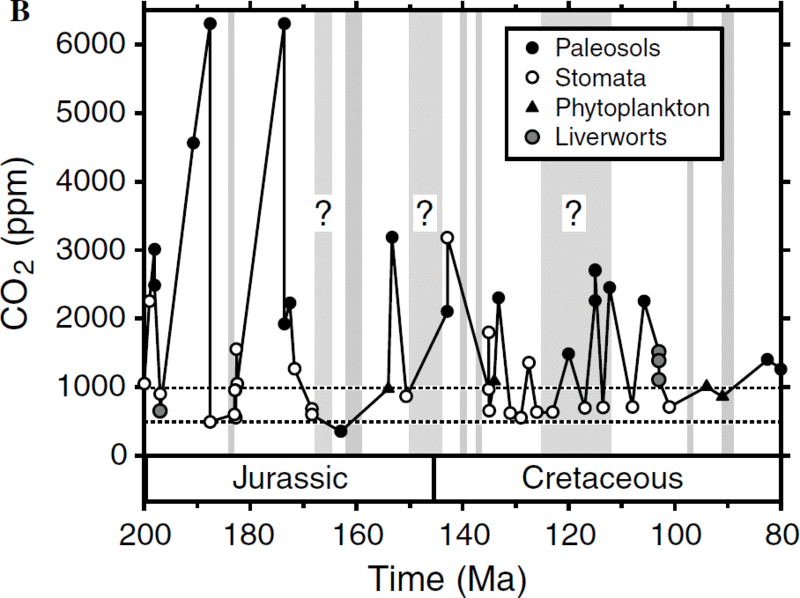 In 2006 Dana Royer wrote a seminal paper about the changes in CO2 in this current geological eon, the Phanerozoic, which covers the past 541 million years. Below are two charts showing how CO2 changed over the past 200 million years. 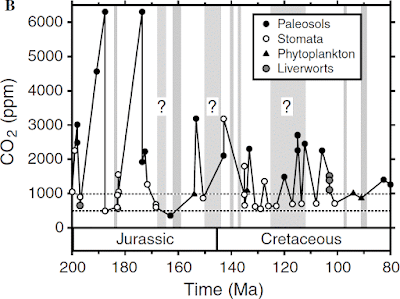 The first chart is for the period from 80 million to 200 million years ago. The second chart is the period from 80 million years ago to the present. As you can see CO2 was much higher in the past (when the sun was fainter), but the decline hasn't been steady. Instead there are very long periods of fairly steady CO2 punctuated by ups and downs. Since the last glacial maximum 18,000 years ago, CO2 has risen from a low of around 180 ppm to 280 ppm just before the industrial revolution. Since then, because we've been adding it to the air, CO2 has risen to more than 400 ppm. The chart below shows how CO2 has risen and fallen over the past 800,000 years. No gradual depletion can be seen. The red line is the latest from the Scripps Keeling Curve as at 19 June 2016: 406.95 ppm. We humans first appeared only around 200,000 years ago. Hover over the chart to see the different levels at different times. ...Many factors are important in controlling the average surface temperature of the Earth, including solar luminosity, albedo, distribution of continents and vegetation, orbital parameters, and other greenhouse gases. The message of this study is not that atmospheric CO2 is always the dominant forcing (see Section 3.7 for an early Paleogene example). 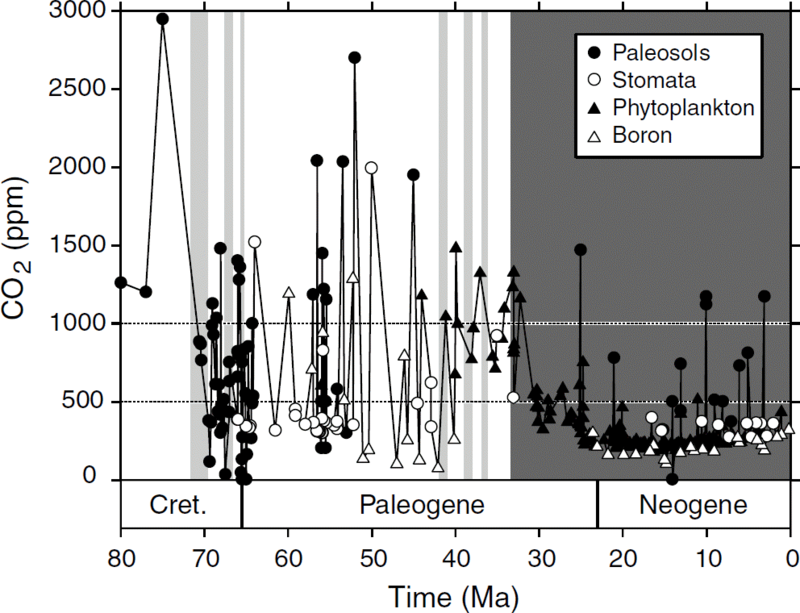 Instead, given the variety of factors that can influence global temperatures, it is striking that such a consistent pattern between CO2 and temperature emerges for many intervals of the Phanerozoic. 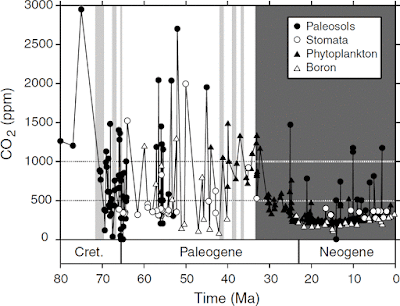 This correspondence suggests that CO2 can explain in part the patterns of globally averaged temperatures during the Phanerozoic. Patrick asks: What evidence or argument is there that the global climate would not revert to another glacial period in keeping with the Milankovitch cycles as it has done repeatedly during at least the past 800,000 years? The global climate will have another glacial period. The next big ice age would have been due in around 50,000 years. We'll skip that one because of what we are doing now. Assuming we add 1,000 to 1500 gigatonnes of carbon to the air, we'll probably defer major glaciations for 100,000 years at least. Patrick asks: What evidence is there that we are not already past the maximum global temperature during this Holocene interglacial period? Patrick asks: How can we be certain that in the absence of human emissions the next cooling period would not be more severe than the recent Little Ice Age? That's a foolish strawman. The Little Ice Age was largely because of volcanic eruptions. So assuming he's talking about what future volcanic eruptions would have done in the absence of human emissions, then he can look to the past. Patrick asks: Given that the optimum CO2 level for plant growth is above 1,000 ppm and that CO2 has been above that level for most of the history of life, what sense does it make to call for a reduction in the level of CO2 in the absence of evidence of catastrophic climate change? Here Patrick is talking about plants growing in greenhouses, not in free air. Even in greenhouses, 1000 ppm is too high for many species, and you don't want it that high both day and night. It's also another strawman. If CO2 rose to 1000 ppm in a matter of decades, as he's proposing, then plants would have a lot more than a rapid rise in CO2 to contend with. In many food-growing regions, plants would suffer major heat stress, drought, floods and storms. Food production would drop hugely and many people would starve to death, those that didn't die from heat-related causes. Patrick asks: Is there any plausible scenario, in the absence of human emissions, that would end the gradual depletion of CO2 in the atmosphere until it reaches the starvation level for plants, hence for life on earth? There hasn't been a gradual depletion of CO2. It's been between 180 ppm and 300 ppm for at least the last 800,000 years. The question he should have asked: What will happen as CO2 rises by much more than it's fallen in the past 800,000 years? As you can see, Patrick Moore is scared that an ice age will come and end human civilisation as he knows it. What he doesn't tell his fans is that CO2 went from 180 ppm to 300 ppm over the span of major glaciations and interglacials of the last million years or so. That's a difference of 120 ppm. Now it's risen by more than that - from 280 to 408, a difference of 128 ppm and it's still rising. What Patrick should be asking is: if a drop of 100 to 120 ppm causes a major glaciation then what will a rise of more than 120 ppm bring? What will happen when CO2 doubles to 560 ppm and more? That's what is occupying the best minds in climate science and it should be worrying Patrick Moore and Anthony Watts as well. ..+ 50 Platinum stars !! Awesome reality…..
TG thinks wrongly that Patrick Moore is "principled". He's no more principled than the unethical Anthony Watts. Dr. Patrick Moore is more principled than the whole worldwide network green of activist combined, it’s a pity there aren’t more like him. Doesn’t Moore realize that actually paying attention to science is a no-no to an activist? Now this is a real Canadian scientist! Thank you Dr. Patrick Moore for shinning light on CO2. It is to be celebrated. Patrick Moore isn't extreme enough for Jay Hope, who probably doesn't know that boats, jet skis, aeroplanes and hang gliders have been around for a while. Is there anything else humans can do, apart from tweaking a chemical compound and changing the climate of a planet that is 4.6 billion years old? Walk on water, maybe??? Turn metal into gold? Dream on Patrick. You’re still a believer! stan stendera is a fake sceptic who believes Patrick Moore about plants close to ending. They weren't. He is wrong. Like most deniers stan doesn't bother with fact-checking. Except, as Dr. Moore points out. plant life actually came close to ending 0nly 18.000 years ago. ( A mere blink in the earth’s history) In the whole of earth’s history runaway warming from CO2 never happened. Patrick Moore (@EcoSenseNow) continues to claim, contrary to evidence, that CO2 "was steadily declining" for 140 million years. He's wrong. Higher CO2 also benefits C4 plants (about 5% of plant species). If you read the entire paper you will see that all your points are taken into account. It is the “net” of CO2 up and CO2 down that determines its concentration in the atmosphere, along with the temperature of the oceans. There was no “steady state” of CO2, it was steadily declining for 140 million years and there is no reason to think that trend would have ended had we not come along and burned fossil fuels. He’s probably not a credentialed climate scientist. Hi Patrick: If she is then my mistake and apology.. BUT….you know this is a typical response from those who disagree with the environmental religion of AGW….”you’re not credentialed or qualified to comment or write papers about “climate science””. I see it all the time. Gary Pearse is a hard-core climate science denier, not even accepting the greenhouse effect. Bravo Dr. Moore. Regarding CO2 and the greening of the planet, there is one part of the idea that adding CO2 in the atmosphere causes a certain quantum of warming that is simply, unequivocally, untrue. Proponents of warming unwittingly, I suspect, assume ‘ceteris paribus’ conditions (meaning all other factors held constant). With greening, along with being a sink for CO2 is also a sink for energy – which is taken out of circulation. That is to say, that from the sterile equation for warming due to CO2 must be subtracted the energy ‘sunk’ in new living matter. 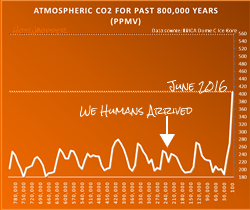 Quick note: Figure 3; 'Humans first appeared' - it's easy to assume that this label is associated with the horizontal CO2 concentration line. "Imbeciles and liars at HotWhopper" :) That just made my day. ..there is no definitive scientific proof that CO2 is a major factor in influencing climate in the real world"
"How can we be certain that in the absence of human emissions the next cooling period would not be more severe than the recent Little Ice Age?" That's the kind of incoherence that gets the WUWT audience in raptures? No wonder they lap up his blithering ignorance of the carbon cycle.